Last week, I posted Fighting Parkinson’s, and you are abundant health. Some of the feedback I have received has mentioned that it is difficult to nurture the seed of abundant health on the inside when the symptoms are pronounced on the outside. My response has been that staying in your heart and calming your mind is driven by having a positive attitude. I have written about this in the past. Here it is again to help bring home the point that you are abundant health and that you need to focus on having a positive attitude. Life is happening. Parkinson’s is happening. How you deal with your Parkinson’s symptoms has much to do with your recovery. Your attitude is a major factor in your recovery. Attitude, attitude, attitude! Your symptoms are happening. Your attitude about what they mean can dramatically change your recovery. 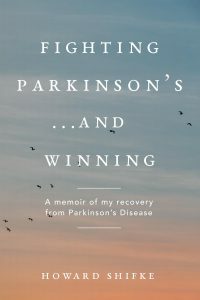 If you can view your symptoms with a positive attitude from your heart instead of a negative attitude from your mind, then you have the greatest opportunity to move forward in your Parkinson’s recovery. Here are some examples of how a shift in attitude changes your recovery. Event: An increase in tremors while doing the Parkinson’s Recipe for Recovery®. Mind: Oh no, I am getting worse. Better stop the Recipe and look for something else. Heart: Excellent, I am getting better. I am generating more internal electrical impulses and they temporarily cause me to tremor more while they are opening blockages in my system. I am abundant health. Event: An increase in stiffness while doing the Recipe. Heart: Excellent, I am getting better. I am generating more internal electrical impulses and they temporarily are shocking the muscles more as they look to open new energy passageways, causing me a little more stiffness in my system. I am abundant health. Event: An increase in slowness while doing the Recipe. Heart: Excellent, I am getting better. I am generating more internal electrical impulses and they temporarily are shocking the muscles more as they look to open new energy passageways, causing me a little more stiffness in my system, and this stiffness is making me move slower. I am abundant health. The mind views an increase in a symptom as “getting worse, only getting worse.” The mind follows the current medical model for Parkinson’s, you will be “getting worse, only getting worse.” With your mind’s attitude following the “only getting worse” medical model, your Parkinson’s symptoms get worse because your mind is filled with fear, anxiety, worry, anger, frustration, and stress…all of the things that helped bring your Parkinson’s symptoms to the surface in the first place. If you stay in your mind, you defeat your own recovery because an attitude filled with this outlook and these emotions, feeds the Parkinson’s symptoms and ultimately makes you stop doing the Recipe and quit your recovery. The heart views an increase in a symptoms as “progress in recovery, everything is progress in recovery.” The heart follows the Recipe model for Parkinson’s, if you are doing the Recipe you are making “progress in recovery, everything is progress in recovery.” With your heart’s attitude following the “everything is progress in recovery” Recipe model, your Parkinson’s symptoms eventually get better because your heart is filled with faith, hope, love, joy, happiness, gratitude, contentment, vulnerability, and forgiveness…all of the things that get your dopamine flowing and rid you of your Parkinson’s symptoms. If you stay in your heart, you enhance your recovery because an attitude filled with this outlook and these emotions keeps you doing the Recipe and ultimately defeats the Parkinson’s and leads to your full recovery. Lose you mind. Find your heart. Have your full recovery. You are abundant health! So true Howard. Our mind is causing all this mess. Calming the mind and opening one’s heart is a way out. Easier said than done, but, it is necessary. Thank you Howard very good advice and helpfull – such clarity. Absolutely Howard. Attitude is everything, but not only mentally having a better attitude but actually acting it out physically. If you feel better, then act it out and do things. Don’t just wait around for your recovery, but do the things that make you happy and don’t examine yourself on how you’re doing them, just do them. What helped me back then, and what continues to help me now, is living out my passion because that brings joy and love to my heart, which in turn releases the dopamine. Believe me, there were many many days that I laid on the couch crying and feeling sorry for myself, but that got me nowhere. It wasn’t until I got up and took the leap of faith that turned it all around. Love to You Howard and all the Warriors! I have found a mantra that helps me tremendously and it is “I am in perfect health as my creator made me.” It takes me to a place where health exists! Thank you Howard. Great post. While giving gratitude, I’ve had minutes of losing my mind and finding my heart. Tony thank you very much for your comments; they are very encouraging. Howard, thank you for another immensely helpful post—another one to be read everyday. We are warriors against our own negativity, for sure. Thanks, Howard! Thanks, everyone in here for the inspired comments. Reading this post and the comments, I feel like the heavens opened up and a Deity spoke these wise words to me.